Lynne Olson will be in conversation with Will Englund. Lynne Olson is the New York Times bestselling author of Last Hope Island: Britain, Occupied Europe, and the Brotherhood That Helped Turn the Tide of War, Those Angry Days: Roosevelt, Lindbergh, and America's Fight Over World War II, 1939-1941, and Citizens of London: The Americans Who Stood with Britain in Its Darkest, Finest Hour. 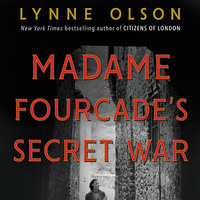 Lynne Olson tells the riveting story of a woman who stood up for her nation, her fellow citizens, and herself in Madame Fourcade’s Secret War: The Daring Young Woman Who Led France's Largest Spy Network Against Hitler. Pulitzer Prize-winning journalist Will Englund is the author of March 1917: On the Brink of War and Revolution, which explores events in Russia and the United States in the crucial weeks before American entry into World War I. A veteran Moscow correspondent, he covered Russia’s tumultuous 1990s for the Baltimore Sun and the 2012 return of Vladimir Putin to the presidency for the Washington Post.